These are special times! We just had the first New Moon after a bunch of eclipses, and now we are about to enter the Autumnal/Fall Equinox on 22/23 September. During solstices the sun is on its highest (summer) or on its lowest (winter) point in the sky. The equinoxes are the points in between; on the start of spring and fall. These changing seasons are important points in the cycle of life, death and rebirth of nature, and we can use these potent times to boost the change we want in our consciousness. The magick of an Autumn Equinox has the energy of letting go and harvesting the new for creating balance, and the desired transformations in habits/patterns/attitudes that are not serving you anymore. So it’s the perfect time to do some positive re-programming of our subconscious mind. We “download” about 1.000 thoughts a second, and based on your subconscious mind, the “best” thought (that is aligned with your inner beliefs) gets chosen. If you clean up and re-program your subconscious mind, you will notice that you will automatically start choosing better thoughts, which translates to feeling better, and having sense of more happiness. In this challenge we will be using affirmations to connect to your deepest desires and inner truth that is waiting to be birthed at this moment. Not only will you re-program yourself to more self-love, but this will project your energy in the direction of whatever your heart longs for. On 21st September you will receive an e-mail with: 2x preparation videos (intro of 5 min + free flow writing video of 15 min), 1x 3 min guided meditation (your daily practice), and a challenge workbook. Register below to get on the list. It’s super easy to do, you don’t need any experience or any props, just yourself and the desire to change things up in your life for the positive! *it will be possible to join this round of the challenge until the next New Moon on 9th October. Ready to create more happiness? 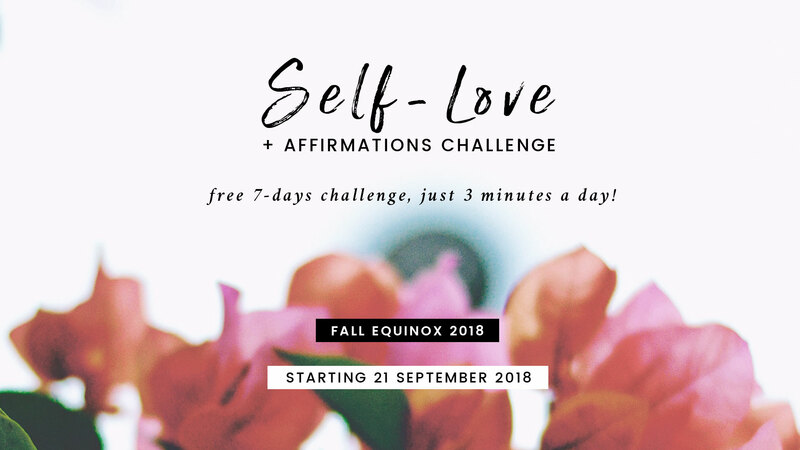 Register below for the free 7-day “Self-Love + Affirmations” challenge! On 21 September 2018 you will receive an e-mail with all the information. *btw, I’ll never share your details with anyone & you can subscribe anytime.